Amazon shares are rising after the company reported a stellar holiday quarter on Thursday. The company surprised analysts with big sales numbers for Alexa and its Web Services. Watch Amazon stock trade in real time here. Amazon reported a stellar fourth quarter and is watching its stock rise on Friday as a result. 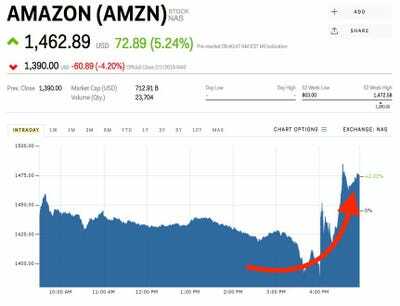 Shares of Amazon are up 5.42% to $US1,465.32 after reporting earnings of $US3.75 per share compared to $US1.83 that Wall Street was expecting. Earnings were boosted by a one-time $US1.59 per share windfall from the new US tax law. The company reported revenue of $US60.5 billion versus the $US59.85 billion anticipated by Wall Street. Amazon’s earnings stand out against the other tech giants that reported earnings this week. Alphabet and Apple are both slipping after reporting their quarterly results after Thursday’s closing bell. Microsoft and Facebook both reported earnings on Wednesday, and each faced their own struggles. Investors were concerned over Microsoft’s slow growth and sent to stock down 0.79% on Thursday after earnings. Facebook was forced to soothe investors worries about a 50 million hour-per-day drop in time spent on its newsfeed and ended Thursday up 3.32%. CEO Jeff Bezos pointed to the massively popular Alexa voice-assistant as the biggest driver of the quarter’s success. The company also reported sales from its Amazon Web Services that reached $US5.1 billion in the quarter. Google’s comparable web service sales hit $US1 billion. “With its dominant leadership positions in two of the world’s fastest-growing markets (e-commerce and cloud computing), we continue to believe that Amazon remains one of the most compelling long-term investments in large-cap technology,” Josh Olsen, Edward Jones analyst, told Markets Insider in an email. Amazon is up 23.63% this year. Read more about Amazon’s Alexa success here.